Amy had asked me to help her design name tags for the ‘Gemilang’s Group’ upcoming project which is a workshop to help primary school students to excel in their exams. Something like a two day program of talks on tips to score in exam papers and stuffs like that, and the name tags were for the committees. The reason why she had asked me was partly because she knew I was capable in these kinds of stuffs, and partly because she already had too much on her hand. Whatever the reason was, I would’ve done it for her anyway. 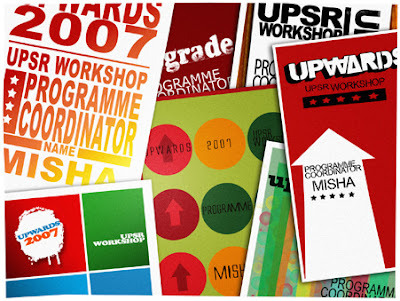 I just love designing – anything really, name tags, posters, web page and whatever else that is in need of designing. I love the whole process of it; from looking for inspirations to the end result. In fact, I wouldn’t mind staying up late, spending time finishing up every single detail, perfecting each step. Besides, I get to get my mind off of engineering which I’m studying right now and that I have to admit, I’m nowhere near excited about. I came up with 7 options for Amy to choose from, but however, we didn’t end up using any one of my designs due to technical problems. I didn’t feel that it was such a waste, because now I can post it up here. Hopefully, Amy would still ask me to help her design name tags or anything regardless of the previous outcome. P/s: - Don’t mind the miss-spelling of what ought to be the word ‘program’. That’s me; always in a state of confusion. Then again, aren’t we all?